In the early days of manned spaceflight, the United States found itself playing catch-up to the Soviet Union, from the first artificial satellite in orbit (Sputnik) to the first man in space (Yuri Gagarin). Gagarin earned to milestones - first human into space and first human to orbit the Earth. Alan Shephard was the second human into space, but the Redstone booster wasn't powerful enough to push the Mercury capsule into orbit. It would be John Glenn, on the US's third launch, and the first using a modified SM-65D Atlas booster that would push Glenn's Mercury spacecraft into a stable orbit. That was February 20. 1962. 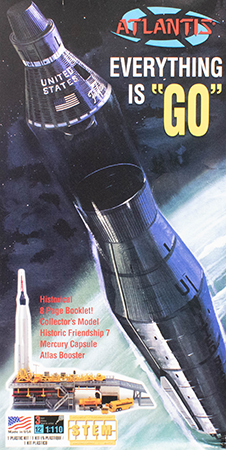 Revell wasted no time producing a model kit to commemorate the first American into orbit with the release of Everything it "Go" later in 1962. This kit quickly became a classic and while it has been reissued a few times over the subsequent decades, it made its last appearance in 1998 after John Glenn returned to space aboard the Space Shuttle Discovery. Fast forward two more decades and was one Revell of the assets of a hobby distributor's bankruptcy, seeing that brand and many of its assets picked up by a German investment company and centralizing operations in Germany. 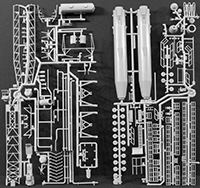 The warehouse full of 'classic' Revell kit molds was acquired by Atlantis Models, and they've already begun the process of producing kits we haven't seen in decades including Everything is "Go". When this kit was originally released, it was far too complex for a young modeler such as myself, and by the time it was first reissued, I wasn't doing much modeling as I had my hands full with my active duty assignment and spending weekends helping to restore a 1:1 scale B-17G. I finally did acquire a few of the kits in the 1990s, but they were put away for a rainy day. Chuck Holte built this kit a few years ago (look here). This reissue by Atlantis retains the look and feel of the original kit. Molded in light gray styrene, this kit is presented on five parts trees and protected inside two sealed bags. These bags are essential as some of the tiny parts had come loose in shipping, but are safely accounted for. For a tooling that is over 50 years old, the kit looks surprisingly great. There are hints of mold flash here and there, but I've seen more mold flash from much newer molds than this. If you look carefully at some of the parts, such as the main deck, you'll note a hint of sink marks, but these are easily filled. The kit represents Launch Complex 14 at Cape Canaveral, the only facility at the time set up for manned space flight using the Atlas (the Redstone launches used Launch Complex 5). What comes in the box is a simplified version of that facility and what is notably missing are the gantries. Where the SM-65 ICBM is stored horizontally with its warhead in place and its tanks partially pressurized, the launch vehicle is assembled while the booster is vertical and one gantry has the crane to hoist the capsule and escape tower up into place and allow technicians access to the vehicle during assembly and checkout. The other gantry provides the swing-away arms for last-minute fuel and ground communication links prior to launch. Neither gantry is here, though there is a trailer/erector that is used to transport the booster to the launch pad. This isn't a criticism of the kit or the kit designers. You can see from the parts in this box that the basic launch stand and ramp are quite complex, and adding gantries would have made this kit overly expensive and complex to build. You only have to look at Revell's 1/144 Space Shuttle kit with Launch Tower to see how quickly a kit can escalate out of control in terms of cost and complexity. As you handle the parts, you'll note how delicate the various handrails are and it is amazing that even though these are too large for 1/110 scale, Revell was able to achieve injection-molded rails this fine 50+ years ago. There are some fantastic photos of Launch Complex 14 with the spacecraft on the pad online, so you can see how the colors should be applied and weathered to achieve that look. This is a fun kit, and thanks to Atlantic Models, you can build this moment of US spaceflight history without paying those collector prices. With thanks to Atlantis Model Company for this review sample!